From the perspective of a Penguins fan, the only thing I have to say to sum up their 6-3 loss to the Washington Capitals is "...........". Sure, I can talk about how Marc-Andre Fleury let in two incredibly soft goals before being pulled midway through the second period. Sure, I can talk about the way the Pens were unable to hold any momentum, twice getting scored on less than 2 minutes after scoring. I can even blame the officials for disallowing a Pens goal that clearly crossed the line before being whistled dead that would have made the game 4-3 late in the second. But we all know that those problems may just disappear during the Pens' next game and possibly be replaced with a set of new ones, so why even bother. For many of the current playoff teams in the conference, it is easy to spot their strengths and weaknesses, but for the Pens it is not so easy. They have undergone a long series of various problems this season that have seemed to correct themselves but then return later on. This inconsistency can be both an advantage and disadvantage as the opposition does not know what to expect, but neither do the Pens. Marc-Andre Fleury started the game with some stellar saves and it looked to be another gem performance, but then faded into the second and gave up two very soft goals to Mike Knuble and Tomas Fleischmann. Perhaps the most commonly agreed upon problem with the Pens would be with the play of their defensemen, especially in transition. This was again an issue right off the bat, with Alex Semin beating Alex Goligoski into the slot and scoring to give the Caps the early 2-0. 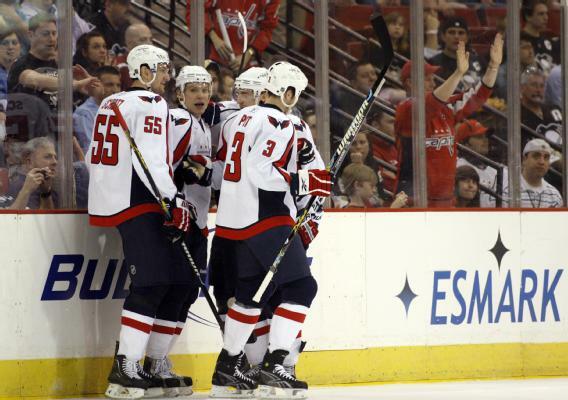 Alexander Ovechkin also had two goals, including an empty netter with less than a second remaining in the game. This was done for the sole purpose of Ovechkin wishing to "pad his stats" and perhaps move up in the race for various individual awards for scoring and points. Despite this whole medley of problems, there were a few bright spots. Jordan Leopold scored two goals from the points just one game after scoring his first as a Penguin in overtime on Saturday. Sidney Crosby also got his 48th goal of the season on the powerplay in the second period, and is tied with Ovechkin for the league lead in goals. Matt Bradley scored the other goal for the Capitals. The important thing for the Pens and their fanbase is not to get too caught up in the flaws shown by the team tonight. With the playoffs less than a week away, the focus shall shift to entering on a positive note, though the Pens' chances of winning the Atlantic Division suffered heavily today with a Devils win, putting New Jersey ahead by 2 points and the tiebreaker with 3 games remaining. Flaws are to be acknowledged and corrected, but not dwelled upon and the most important thing to remember is "Win as a team, Lose as a team." I encourage everyone to tune in on time for Thursday's game against the New York Islanders, as there will be a ceremony to honor many of the great Penguins of old in the last regular season game at Mellon Arena. The game will also carry massive importance, as it will be nearly a must-win situation if they want to stay in the hunt for the division title.